When I left my job designing software to start cartooning I made an agreement with my wife. I'd give it two years, three at the most, to make a living as a cartoonist. Well it's been almost four, and still there was nary a peep from my very loving and supportive wife. But the truth is that while we have made a real business out of Overdue Media, with respectable book and merchandise sales and the odd speaking engagement, it isn't paying the bills. Well, not most of them, anyway. I calculate we'll need an order of magnitude more readers to get to that point (tell your friends! ), and while I have no doubt we'll get there I can't say just when it will happen. Next year? Two? Five? It's time to stop guessing and time to go back to work. So starting a week from Monday I'm returning to Microsoft after a seven year absence. I'm coming back at a pretty senior level working on a very cool project about which I'll reveal more when I understand how secret it is or isn't. I can't tell you just how excited I am to have benefits and a regular paycheck after four years in the wilderness. It's like moving back in with my parents, except less yelling and screaming. 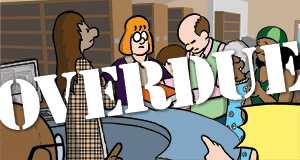 What does this mean for the aforementioned Overdue Media and Unshelved, a comic strip about a library? Hopefully very little. I'll still be drawing the strip every day before I go to work and on weekends. It's true that we will probably produce many fewer books and special projects than we would have otherwise. But it's also true that this will probably force us to prioritize and delegate in a way we otherwise wouldn't have had to, and that may be a net positive. For example, we are going to try to hire someone to run the whole merchandise side of our business, something I shouldn't really be spending time on except for the initial design and strategy phase. We are still signed up for both ALA conferences and Comic-Con in 2005, and I will still take select speaking engagements depending on timing and pay. I couldn't do the strip without a chance to visit with our fans, and until you start dropping by for breakfast we'll have to do it the other way. Thanks to all of you who have supported this little experiment in comic strip self-sufficiency. It's not a failure, I'm just lengthening the timespan and thus removing an annoying sense of urgency. By the way, we did consider doing a big pledge drive like The Norm and others, and it's not out of the question we'll do so in the future. But for now it wasn't the right choice for us. So I'm looking at the number of readers who receive our email delivery, and it's slowly creeping past the mid 7700's. Our actual readership is about twice that, what with people who read by RSS, on the website, or syndicated on other websites, but that's the only hard number we have and as numbers go I find it a little messy. I think a number like 8000 would be much more pleasant. And I think we can get there by the end of the year. If you have been meaning to tell your friends, coworkers, family, fellow listserv members, and blog readers about Unshelved but have been waiting for the right moment, I think this is it. May I suggest you find one of your favorite strips in the archive and use the "Send To a Friend" feature to alert them to our presence? I hope I don't have to underline the fact that even though our strip is set in a library it's meant to be read by people of all professions and persuasions. That said, it seems to have particular resonance for library workers (duh), booksellers, IT professionals, and those who have to deal with the public on a daily basis.